Ames Study Manager, developed by Perceptive Instruments, and now part of the Instem solution portfolio, is an integrated suite of software for conducting the Bacterial Reverse Mutation Test (or Ames Test) according to regulatory guidelines. Ames Study Manager is used by the majority of the world’s leading pharmaceutical and contract research organizations and has an excellent reputation for increasing productivity, while improving compliance with GLP regulations and requirements. Compatible with all types of study designs and offering flexible, customizable reporting, Ames Study Manager can be tailored to meet your organization’s specific processes. Plate observations for contamination, precipitation etc. Our automatic colony counter (Sorcerer) gives you immediate, reliable results. Study templates allow you to save frequently-used study designs, so you don’t need to worry about re-configuring, re-typing or re-entering setup information. Data collection is integrated with the system and as soon as data is collected, it can be reported. There are no transcription steps or file transfers. Reports are created automatically and can include data tables, graphs and statistics. Historical control ranges are created instantly. Ames Study Manager has been designed with reference to the OECD and S2(R1) guidelines, so the workflow should be familiar to you. In this fully compliant system, the creation, editing and deletion of data is recorded within an audit trail. Original data are never obscured; where a data change is made, the old and new values are visible along with any reasons given for the change. Ames Study Manager offers complete flexibility, allowing you to choose the number of studies, experiments, strains, treatment groups etc. In addition, your control groups can be shared between experiments, should you wish. The system supports an unlimited number of dose levels, which can be assigned different metabolic activation in the same experiment, if required. However you’re conducting the OECD Ames test, we are confident that Ames Study Manager can be configured to your experimental set-up. All of Instem’s genetox solutions are designed with reference to the OECD and S2(R1) guidelines. 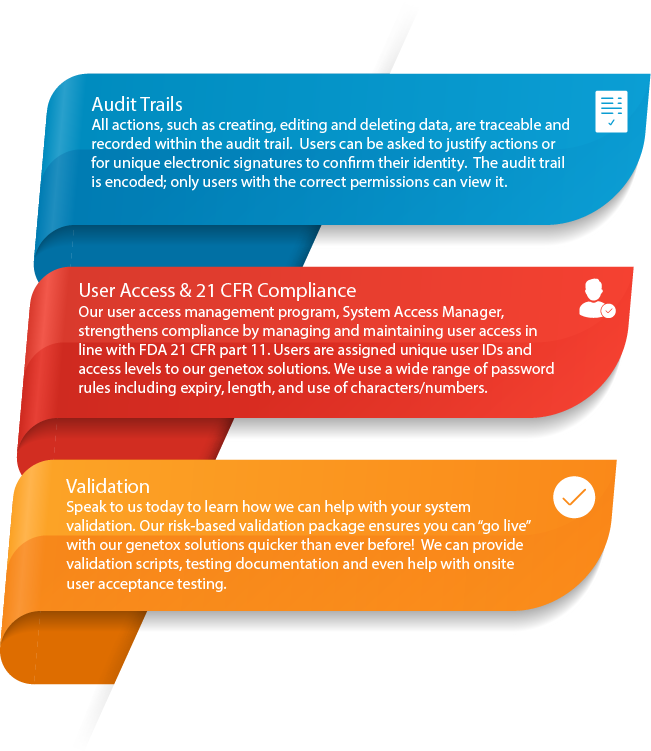 We ensure our solutions are fully compliant with the principles of Good Laboratory Practice (GLP) and the FDA 21 CFR part 11 rule on electronic signatures.